Super Hero Bike Mega Ramp is the best super heroic racing game from MTS Free Games. Did you ever imagine if you had super power what all you could do???? Welcome heroes to the play with your coolest Super Hero & check out their amazing superpowers. The best part is you have to choose an attire of a Super Hero and ride on the toughest mega ramp with your ultimate power bikes. Freak out!!! This is the realistic yet challenging racing game on bikes as Super Heroes. This is so exciting!!!! There are unique levels which will drive you crazy & do challenge you friends to play. Are you ready to be a super hero?? Grab your coolest superhero jump on the ramp & drive!!! Get ready for the coolest yet craziest adventures ride of your life of being a Super Hero!!! Share this gameplay on all the social websites to unlock levels & more surprises are waiting just for you!!!! The gameplay is to choose your Super Hero & race on different mega ramps. You can be like an amazing Spiderman to race on ramps & show off your cool stunts. We know that you are fond of flying like a Superhero! So, become a flying superhero & get ready to race. 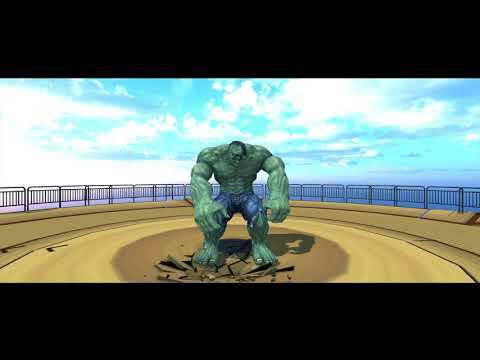 Enjoy playing as a huge greeny Hefty Hulk, as he is an outstanding incredible Super Hero whose anger can make you go crazy on ramps. Hurry Up!!! This is an amazing gameplay for all superhero fans. I am a Super hero fan!!! Download & Play the heroic freestyle game with Super Hero Bike Mega Ramp. Super Hero Bike Mega Ramp will be updated regularly with your suggestions. Don't forget to leave a review with your feedback.